ArcGIS Workflow Manager is an enterprise workflow management application that provides an integration framework for ArcGIS multiuser geodatabase environments. It simplifies many aspects of job management and tracking and streamlines the workflow, resulting in significant time savings for any implementation. Workflow Manager provides tools for allocating resources and tracking the status and progress of jobs. A detailed history of job actions is automatically recorded for each job to give managers a complete report on how the job was completed. This information can be supplemented with comments and notes to provide even richer job documentation. 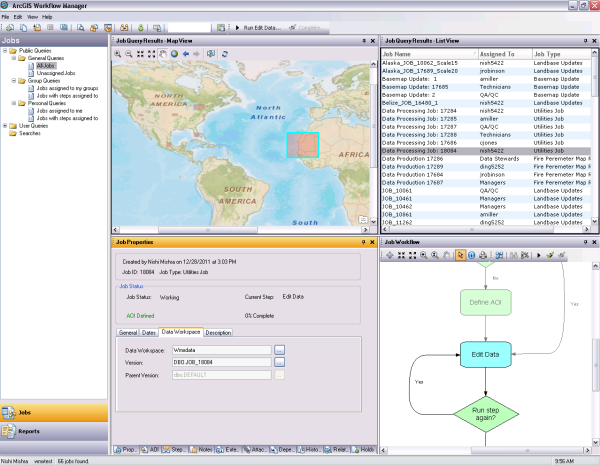 Workflow Manager handles complex geodatabase tasks behind the scenes by assisting the user in the creation and management of versions. An integration of the Workflow Manager and ArcGIS geodatabase tools provides a way of tracking feature edits made through Workflow Manager jobs using the geodatabase archiving tools. Job creation is simplified through the tools available in Workflow Manager. Work can be easily created and assigned to registered Workflow Manager users within your organization. Using the tracking tools available, Workflow Manager allows you to identify the who, what, when, and how of activities on all jobs within your organization. Workflow Manager also provides you with step-by-step information on these jobs. With the Workflow Manager application, you can define your business process using the workflow tools available. These workflows represent blueprints for the steps required to accomplish a set of defined tasks or projects. Since your business process might change over time, Workflow Manager allows you to make changes to your blueprints throughout their existence. These workflows are associated to job types. The life span of a job type goes through phases: Draft > Active > Retired. These workflows provide you with the flexibility of controlling which job types are available to your end users. Areas of interest (AOIs) allow you to define jobs spatially. There are tools that allow you to create jobs based on user-defined boundaries. These boundaries could be freehand drawings or might come from existing geographic data like shapefiles or feature classes. The AOIs can be represented on maps using symbols to allow you to quickly identify jobs of interest. The job types usually have a workflow associated with them. These workflows consist of steps that execute applications or perform some automated tasks. The steps that are available in the Workflow Manager library allow you to open a predefined ArcMap document, executables, geoprocessing tools, URL addresses, or custom applications that are business specific. The reports provide a real-time view of the jobs in the Workflow Manager repository. This allows you to communicate information to stakeholders by defining the contents of the reports. These reports can be executed on the desktop and/or through the Workflow Manager Web services. In some organizations, the GIS work is done by staff in different geographic locations. The network might cause a bottleneck in such situations. By using the repository replication tools available in the Workflow Manager administrator, you can share an identical configuration across multiple servers and synchronize the contents to keep track of the GIS work being done at the various locations of your organization.